Introduction: Laparoscopic hepatectomy is the latest development of minimally invasive surgery. Traditional indications for laparoscopic hepatectomy include lesions in the anterior-inferior and left lateral aspect of the liver. For lesions in the caudate lobe, the left lateral section of liver frequently interferes the surgical exposure and mandates lateral sectionectomy occasionally in traditional open hepatectomy. In addition, the close relation to the IVC and dissection of short hepatic vein are possible obstacles. For the particular anatomical location, laparoscopic isolated caudate hepatectomy has been reported rarely. Methods: We reported a 46 y/o woman, a victim of rectal cancer who received laparoscopic radical proctectomy 13 months prior to this admission. A 4x3x3 cm hypodense lesion was found in segment 1 of the liver in CT scan performed for progressively elevated CEA. The lesion is close to the junction between the left hepatic vein and IVC. Computed PET scan was done to confirm the metastatic nature of the lesion and also exclude the possibility of other metastasis. Laparocopic S1 caudate hepatectomy was done through 4 port technique. The patient was placed in modified lithotomy position and pneumoperitoneum was set up. After adequate hepatic hilum retraction and exposure, the inflow vessels to the S1 were dissected and divided selectively. The liver parenchyma was transected by EndoCUSA. The short hepatic veins were dissected and divided. The section margin was free and the patient recovered smooth after the surgery. The patient resumed oral intake the day after surgery and the postoperative hospital stay was 4 days. Results: The operation time was 165 min and estimated blood loss was 20 c.c. The patient resumed oral intake the day after surgery and the postoperative hospital stay was 4 days. The postoperative course was uneventful. 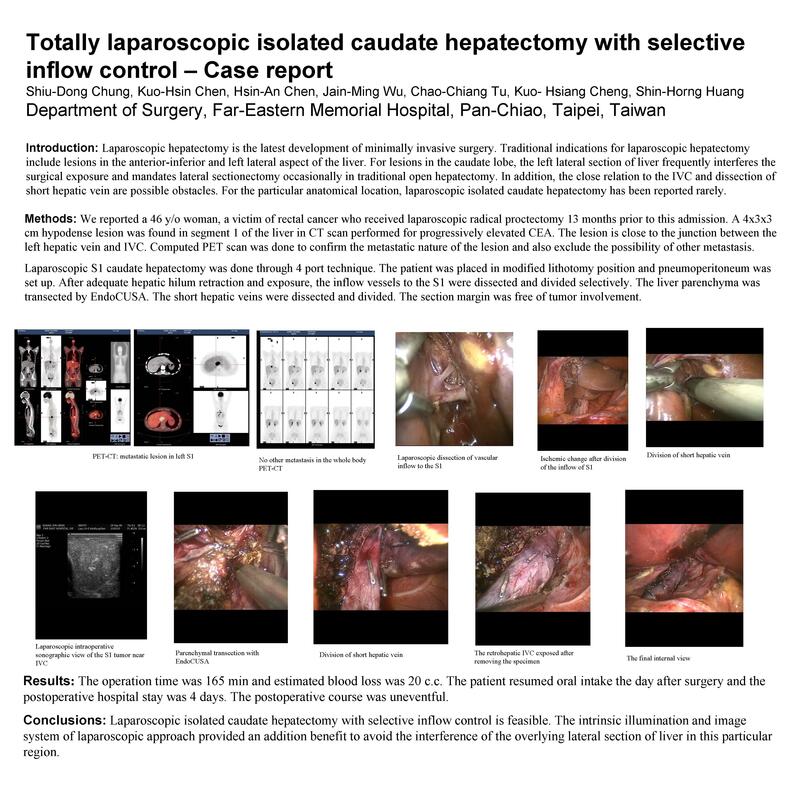 Conclusions: Laparscopic isolated caudate hepatectomy with selective inflow control is feasible. The intrinsic illumination and image system of laparoscopic approach provided an addition benefit to avoid the interference of the overlying lateral section of liver in this particular region.